The personal driver of Senator Dianne Feinstein (D-CA), 85, for some 20 years was a Chinese spy. Even worse, this happened during Feinstein’s tenure as Chair of the Senate Foreign Intelligence Committee (2009-2015). Worse still, we only found out about this FIVE years after Feinstein retired — not fired — the driver after she was informed by the FBI that the driver is a spy for the People’s Republic of China. Matier & Ross report for the San Francisco Chronicle (SFC), August 1, 2018, that “a local source who knew about the incident” said the FBI showed up at Feinstein’s office in Washington, D.C., about five years ago to alert the then-chairwoman of the Senate Intelligence Committee that her driver was being investigated for possible Chinese spying. The source said the intrigue started “years” earlier when the staffer took a trip to Asia to visit relatives and was befriended by someone who continued to stay in touch with him on subsequent visits. That someone was connected with the People’s Republic of China’s Ministry of State Security. The source insists that Feinstein’s driver “didn’t even know what was happening — that he was being recruited. He just thought it was some friend. Besides driving Feinstein around when she was in California, the unnamed staffer also served as gofer in her San Francisco office and as a liaison to the Asian American community, even attending Chinese Consulate functions for the senator. According to Politico, the driver had provided political intelligence — but nothing classified — to his handlers. A former U.S. intelligence official said the driver was “run” by officials in the Chinese Consulate in San Francisco. This is not the only time when Dianne Feinstein is implicated in spying. The dossier, which was also funded by Clinton’s campaign and the Democratic Party, was used as evidence in the FBI’s warrant to secretly surveil Trump campaign associate Carter Page for more than a year. What is the driver/spy’s name? Why is his name not disclosed to the American people? Has he been arrested and prosecuted by the Department of Justice? This entry was posted in Liberals/Democrats/Left, United States and tagged Christopher Steele, Daniel Jones, Dianne Feinstein, Dianne Feinstein's Chinese driver, Fusion GPS, Russian dossier on Trump. Bookmark the permalink. Why do people such as Feinstein, Billary Clinton, Nancy Pelosi….etc etc…suddenly lose the ability to drive their own cars in these positions they “hold” ( in the LONGEST SENSE OF THE WORD…HOLD…forever and forever…..)? Is it against some Congressional/Senate/State Dept. Law??? Since I’m paying for these jackasses out of my tax-payer pocket…I want to know. In fact, I’d like to have MAILED to me as an interested investor, the expenditures EVERY YEAR for my congressmen and senators, so I can decide whether or not I like where they are funneling my tax dollars that pay their salraies and claimed expenditures. The Democratic Party is nothing more than a Communist Party on American soil. 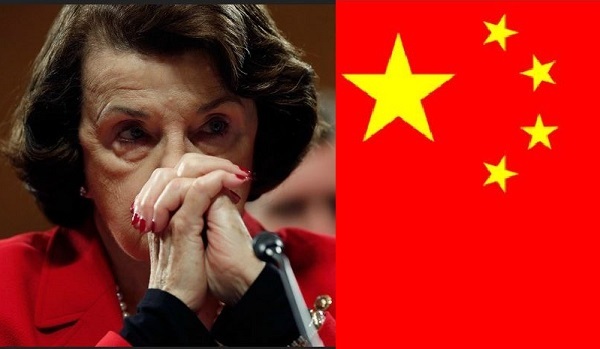 As Communism is Jewish, and China is Communist, it’s not surprising that Dianne Feinstein had a Chinese chauffer.